Mowing has been carried out with hand mowers at 6 mm, removing the growth from the mild winter. Top dressing of 5.5 ton/ha (light dressing) has been applied to keep surfaces firm and dry; this will continue every two weeks if weather conditions allow. Play on greens during frost has not as yet shown any negatives; this will continue to be monitored. Greens, aprons and tees have been receiving a monthly spray of Fe.N to keep plants healthy. Tee positions are being moved around to spread wear to avoid areas around tees becoming damaged. A lift and place rule has been implemented on the 8th and 11th fairways to minimise wear. 2nd, 8th, 11th and 13th fairways have been sprayed with Fe.N to help plant health. 11 bunkers have been rebuilt using Astroturf faces and these bunker surrounds have been turfed with fescue turf. The bases on these bunkers have been shaped and are ready for sand. A herbicide has been sprayed on the heather to hopefully control the grass, to enable the heather to flourish. Committee has completed a course walk to examine and discuss gorse control and management. 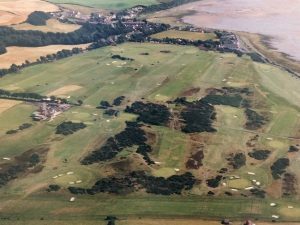 Whilst the gorse is needed at Powfoot it is out of control and encroaching into roughs and heather areas. The top photo, taken in the late 80s/early 90s, shows how far the gorse has grown since then. A management plan will be put in place to take back the areas of gorse to resemble those shown in the photograph.